The Ultimate Explorer’s Kit has all the tools you will need to get outside and explore! A family friendly activity, fun for all ages. The perfect kit of tools to reconnect with nature and the people around us. The Ultimate Explorer’s Kit comes with (2) Search & Find Adventure Cards of your choosing, a pair of high quality sports binoculars, (5) tiny washable markers, and a magnifying glass. Open up your Explorer’s pouch and pull out your tools. Examine your Search & Find Adventure cards to see what you will be searching for. 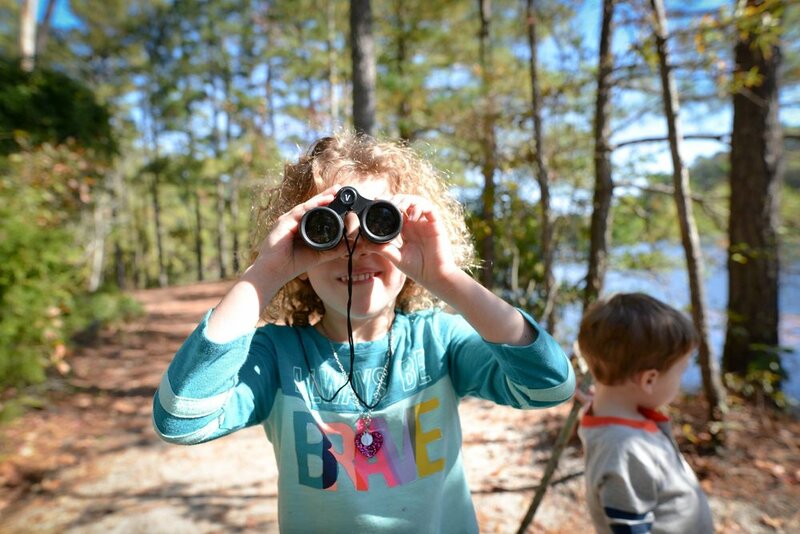 Binoculars can go around your neck, and head out into the woods, your neighborhood, or the beach! Take your time to observe your surroundings, up high in the trees, or down low on the ground. Use your bag to collect tiny (non-living) things like rocks, shells, leaves pinecones or acorns. Point out the word on the card, that matches what you find.